Mark Newell Tree Care Ltd. 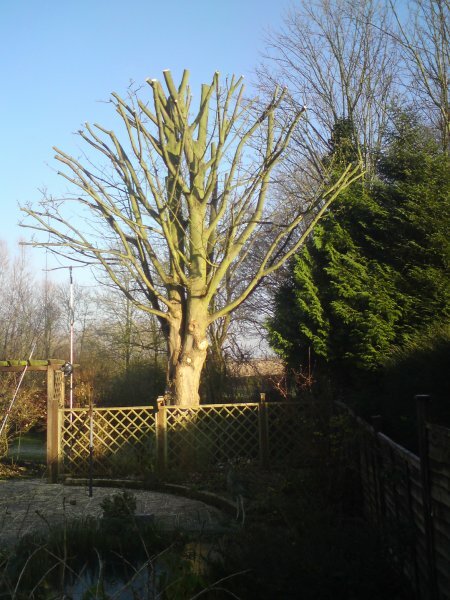 When there is sufficient space and the tree is suitable, a tree can often be taken down in one, providing it is safe and will not cause any disruption. Once on the ground it can quickly and easily be processed. 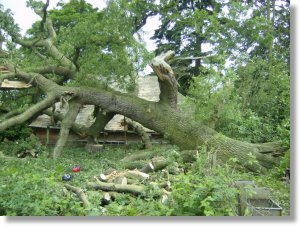 Removing a tree when space is limited or obstacles are present such as; priceless statues, utility lines, green houses, garages, fences and sheds. The list is endless, and we love a good challenge! The tree is brought down to the ground in sections attached to ropes. The descent of the section is controlled via a variety of techniques and equipment depending on the constraints of the job. 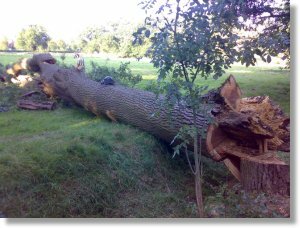 It can at times be too dangerous to take a tree down using the tree itself as the main stem can often have been compromised. Sometimes we can use a neighbouring tree to lower the sections. 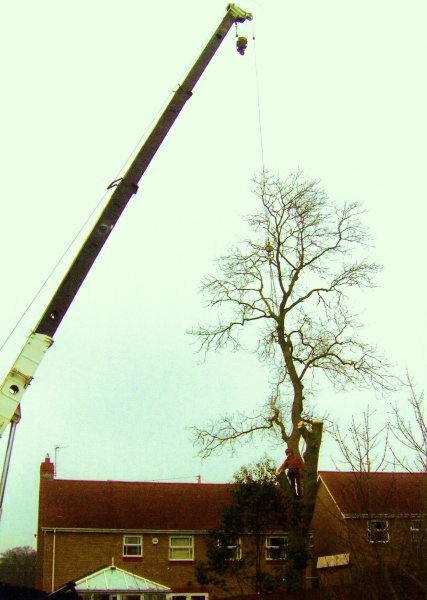 If this is not possible a crane is used, it is a very efficient way of safely removing a tree. 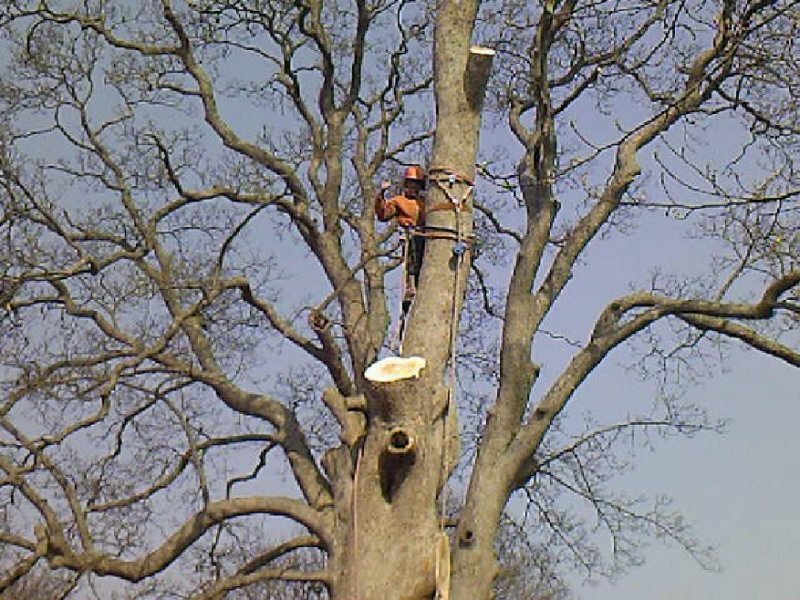 It is surprising how a large tree can be taken down in such small areas leaving no trace of the work carried out. A reduction is making a tree smaller. Whether it is shortening one interfering branch or making the entire tree smaller by reducing the size of the crown. A tree can be reduced to reshape it, making it more aesthetically pleasing, reduced to minimise interference with an adjacent building or structure or reduced to minimise leaf surface therefore decreasing demands made on the root system. 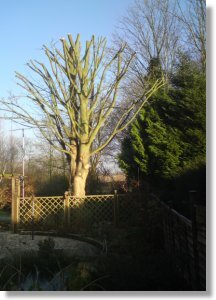 Pruning is a general term that relates to all types of cutting of branches for different reasons. Such as helping the tree form a satisfactory to well balanced crown, to removing diseased, damaged, dead or dying branches. The term pruning is more commonly used when regarding fruit trees and young trees of nursery age. The pruning of fruit trees is commonly done once the leaves have all fallen off and the tree is dormant as to not disrupt the fruit production, although with cherries and plums it is said they should be pruned in full leaf to minimise any risk to the tree. 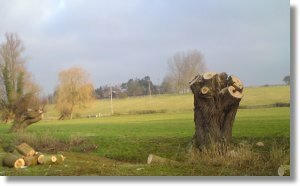 Stumps are left when a tree is removed. These can remain in the ground without causing problems. However sometimes removal is necessary. Stump grinding is the most efficient way of completely removing a stump, the Stump Grinder is an engine powered machine with hydraulic motors and pumps powering a large spinning toothed flywheel which is used to grind out the stump. 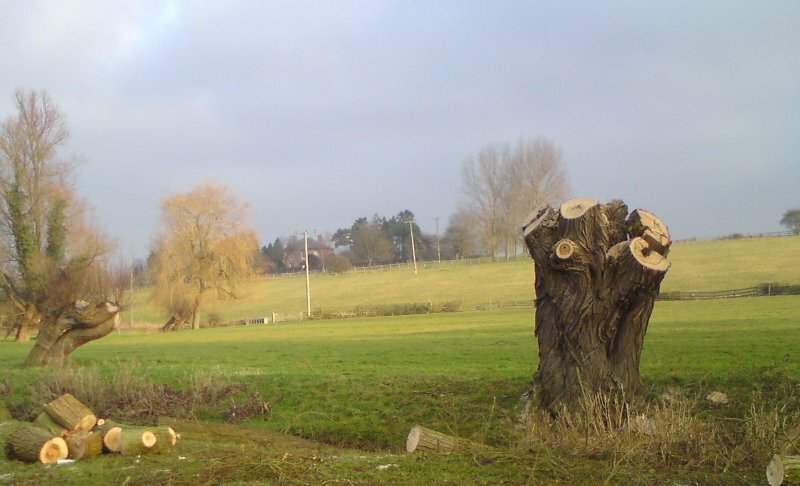 Stumps are ground out when they are thought to be unsightly or when the stump is in the way for example, putting in of building foundations or where a new tree is being planted. Thinning is making the crown of a tree less dense. There are several grades of thinning and the grades are measured in percentage. 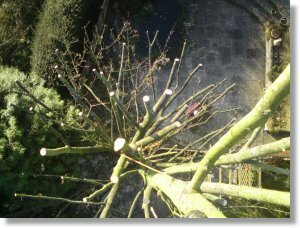 Removal of dead wood, broken branches and crossing branches is the lightest form of thinning and would be classed as 10%. 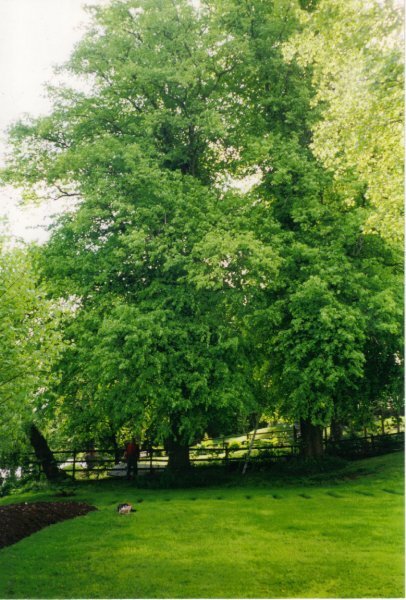 Thinning the leafy area by 25% can minimise risk of wind throw as it allows the wind to pass through the tree, which also lessens the risk of disease. 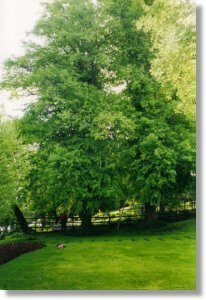 Thinning can also be used to allow light through the tree to create a more dappled light effect as opposed to dense shade. 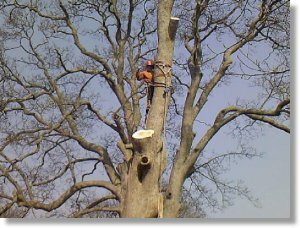 In mature trees thinning can be used to reduce weight on specific limbs helping them to cope with structural defects like cracks. 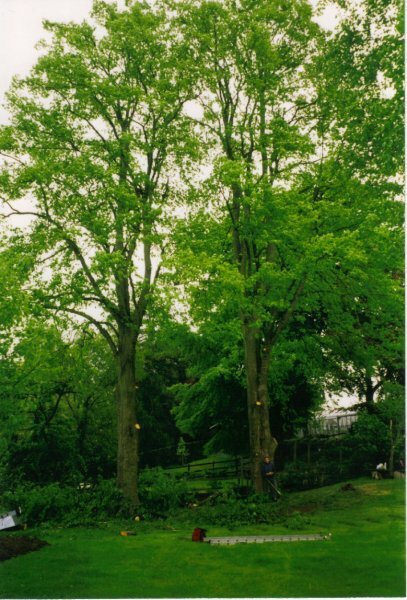 If a tree is thinned properly it will not alter the overall height and width of the tree and leaves the tree with an inner crown - it is all too common to see the inner crown completely removed which is bad for the tree. 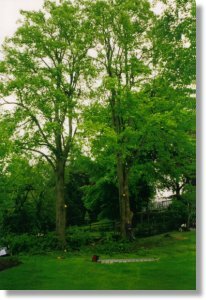 Lifting is raising the crown of the tree, whether it is removing epicormic from the base of the tree or removing whole branches. The reason for this is to stop the lower crown obstructing the ground underneath the tree, for example, branches overhanging driveways and roads that are obstructing vehicles. 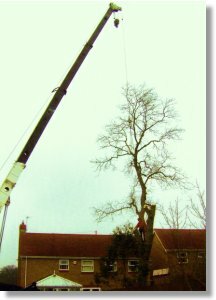 It is often that the lower branches of a tree can touch the top of a house, this can easily be remedied by lifting. 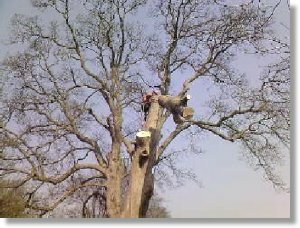 Pollarding is complete removal of the crown of a tree- cutting back at the head of the main branches to allow bushy growth of foliage - maintaining the tree at a certain height. Once a tree has been pollarded it is essential this continues with pruning taking place every few years. 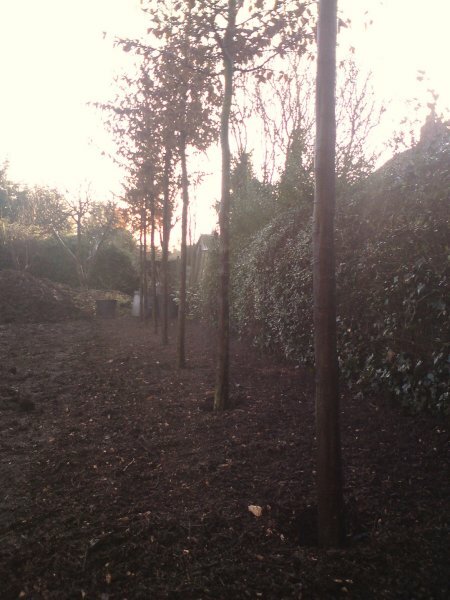 Pollarding can be used to keep large mature trees small if growing in a restricted place to prevent them outgrowing their allotted space, obstructing utility lines, and obscuring view. There are certain species of tree that can be pollarded a typical example is the Willow. 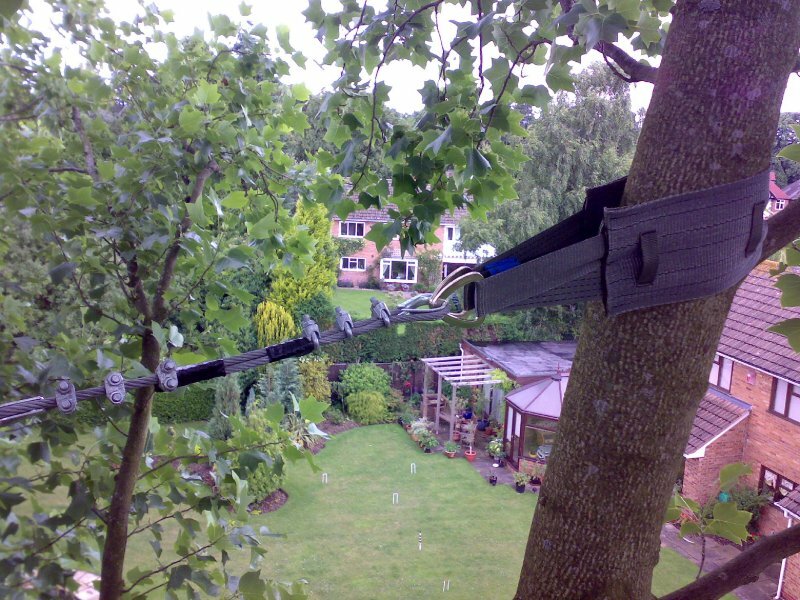 Cable bracing is bracing a branch or stems with straps and cables to form a brace holding either a damaged or rotten branch in place or holding two stems together, usually to provide support due to splits or included bark. 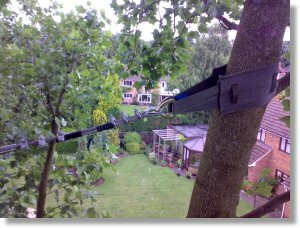 The brace is a flexible support which allows for a certain amount of movement so the tree can still move in the wind as the tree is naturally designed to do so. 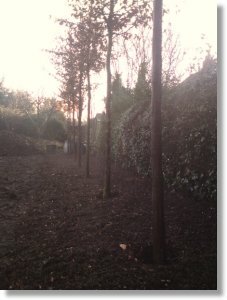 After many years working with older trees - working to preserve what we have and quite often removing trees due to their location we are keen to replant for the future whether it be to replace a tree we have removed or planting specimen trees in new gardens, we even plant hedge rows and small new woodlands in larger estates. Deadwood is branches that have been shut down by the tree as they are no longer required, broken branches and stubs are also classified as deadwood. 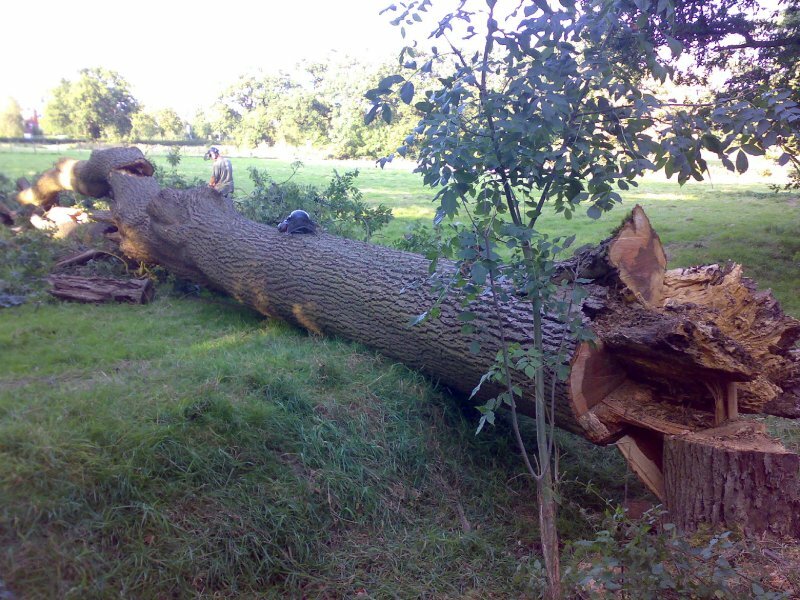 Deadwood is often removed for safety reasons as it can often fall out naturally when it loses its grip or breaks. 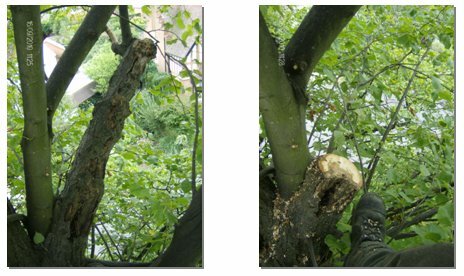 Just removing the deadwood can often miraculously change the appearance of a tree, making a tree look much healthier and safer than before. 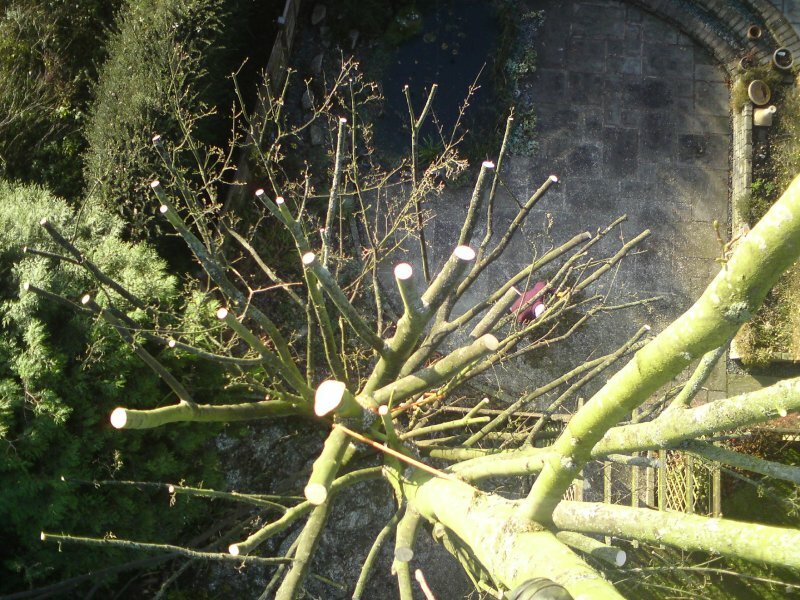 In addition to our other services we offer an emergency callout service for any tree emergency - from broken branches to entire trees – this service operates 24 hours a day. 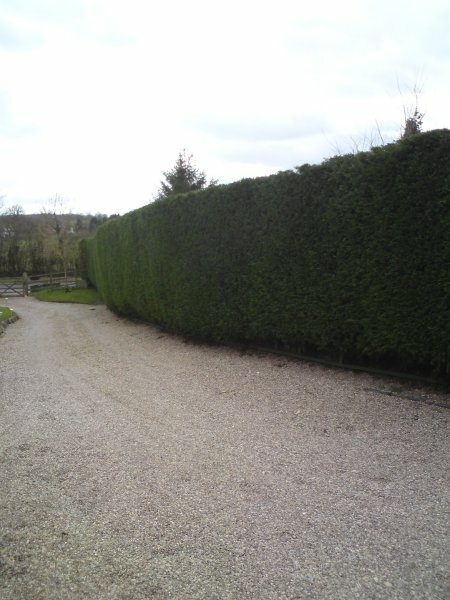 We can also cut your hedges (no matter how big or small) to a very high standard. This also includes ornamental shaping of hedges and archways.